I wonder if harsh economic realities could transcend generally accepted logic. The common perception of unravelling events relies, by and large, on politicians remaining in close control of events and in particular in tight control of their societies. But when institutions start running out of cash and people don’t get paid on a grand scale (which must now be well and truly on the cards in saying the coming 1 – 3 years, if not within the coming months), then politicians’ grand economic and political plans can rapidly turn in to the proverbial ‘ball of chalk’. Like many people I struggle to discern the details of unfolding events over the coming months. 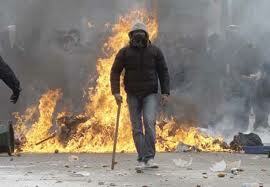 However, my age and instinct tell me that Europe’s political elites are losing control of their own societies even now. There are more than 18 million people unemployed in Europe today and, for as long Europe’s political class stays on its current course, that unemployed rate will climb and climb. That’s a really bad state of affairs; indeed, it’s life-threatening. Eventually, I judge that the smouldering European tinder box will burst forth in to flame and thence on to conflagration. At which point all bets are off. No amount of logical and neat arguments about how politicians will engineer a European superstate without an explicit democratic mandate so to do will counteract the incandescent rage that could grip a critical mass of European citizens going without work, going without shelter, going hungry and living without hope. It’s this ‘direct action’ by angry citizens that would scupper the controlled, totalitarian formation of a European superstate, I believe. But I accept that I may be quite wrong in this and that the Europeans could well end up stumbling like lambs to the slaughter when it comes to their political masters implementing a ‘coup de continent’ and forcing the formation of the United States of Europe on 495 million people. God help them if it happens that way. And if it does, there would need to be revolution in the UK to prevent our own political class from stitching us in to that self same socialist-fascist nightmare that would be the nascent USE. Frankly, with each passing day now I can barely believe what the European political class is doing and getting away with. It’s both scary and shameful and made so much worse by the benign way in which our own ignorant and cowardly political class just goes with the flow. Europe is on the verge of being raped and our own politicians don’t know where to look, still less what to do. Team GB Win Equestrian Silver. It’s Not Doping, It’s ‘Scientific Training’. 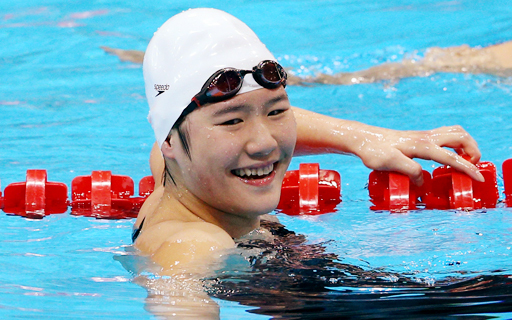 John Leonard, the executive director of the World Swimming Coaches Association, has caused a bit of a storm, and brought upon himself accusations of sour grapes, by implying yesterday that Ye Shiwen, the 16-year-old Chinese swimmer, may have taken performance enhancing drugs when she won the women’s 400m individual medley in a world record time. Rightly, we should give every competitor the benefit of the doubt, especially when, like Ye Shiwen, they have never failed a single doping test. Nevertheless, I think it is only fair to point out that during the 1980s and 1990’s Chinese officials were similarly aghast when similar accusations were made against Chinese swimmers and athletes and yet we’ve since found out that there was a state sponsored program of doping, known euphemistically as ‘Scientific Training’. The Chinese women’s swimming team came from obscurity to win 12 of 16 gold medals at the 1994 world titles in Rome, prompting suspicion among competitors but the Chinese team was decimated by positive steroid busts that same yearat the Hiroshima Asian Games. This was not, as the Chinese authorities claimed at the time, an issue of a few bad apples but a state sponsored program. Now, you can believe that the Chinese are now all squeaky clean or just more sophisticated in their doping, it’s up to you. The problem is that those whose job it is to detect new doping methods are always one or two steps behind those that are inventing them. It is generally the poorer country’s athletes who get caught, as they can only afford the doping methods from ten years back while the wealthier countries can afford to invest and innovate. This frees up money for the banks to lend…. But will they lend to the private sector ? Will they hell ! What does this mean for Spain ??? The markets will then sell off their current and new holdings because the likelihood of a default has increased…. Full Spanish Bailout Will Cost €650bn …………..It’s Impossible ! It’s always absolutely terrific when economic realities start to slaughter political fantasies. Personally these days I’m placing all my bets on economic realities eventually destroying first the euro monetary union and then second the European Union (EU) itself. I’m reasonably hopeful about the euro collapsing, but I fear that the EU will prevail for some time to come. The EU will probably have to be destroyed by the direct action of citizens rather than by economics per se (normal democratic arrangements in Europe have been all but snuffed out by the Lisbon Treaty). That said, in the end economics is really only the actions and study of humanity itself and as such its ideas are often little more than common sense (according to Ed Conway, anyway). So, we have to trust that eventually common sense and humanity will prevail over Europe’s oligarchic ruling elites and that order and prosperity will return to the European continent. On the other hand, if Europe’s ruling mafia (that toxic mix of arrogant politicians, unaccountable bureaucrats and all-powerful bankers) prevails, then God help Europe’s citizens over the coming decade. Incidentally, where the hell is anyone going to find €650 billion just like that? Let’s be honest, by any measure you care to choose, the euro/EU is unmitigated madness. As an ex-military man, I learned that a deception plan is an integral and vital component of any battlefield strategy. The European Union will almost certainly turn out to have been one of the greatest deceits in history. The citizens of Europe and the UK were never supposed to understand the true intentions of their political elites. But, “oh what a tangled web we weave, when first we practise to deceive …”. Europe’s politico-bureaucratic and banking “elites” are seemingly oblivious. Indeed, even millions of European citizens themselves still seem to believe the euro/EU to be fundamentally “a good thing”. In my view, this has everything to do with the European Commission’s annual “communication” (propaganda) spend of some €2 billion. European citizens don’t know if they’re coming or going. They think they believe in the euro/EU, but they know they don’t like 25% unemployment (and climbing) and standing in lines at soup kitchens. We’re witnessing the most grotesque disconnect between a ruling elite (a toxic mixture of politicians, bureaucrats and bankers) and the ruled themselves. The situation in Europe has all the ingredients of revolution, if not sooner, then later … at this rate anyway. There are days when I think that if Europe’s politico-bureaucratic-banking elite press on with “ever closer union” whilst singing the euro/EU is “irreversible” chorus, then there’ll come a day when the European Commission headquarters will be razed to the ground by a critical mass of disaffected and hungry Europeans. Meantime, however, most European citizens still seem to be oblivious to the trajectory of their beloved project, whilst most Brits probably couldn’t give a toss about Europe for as long as ‘Britain’s Got Talent’ and ‘Come Dine With Me’ are showing on the telly (if you see what I mean). You can sense how frustrated Winston Churchill must have felt in the run up to WW2 … it’s surreal watching Europe descend slowly but surely in to socio-economic chaos (or enforced misery at best), knowing that it needn’t be like this. We’re probably witnessing the most destructive example of ‘groupthink’ in modern history. Correcting the Record. Not German President and not Nazi Salute. Last night I posted that German President Joachim Gauck appeared to give a repeated Nazi salute. It appears I was wrong. I’m going to paste below the comments of one Youtube user, including castigation against Brits, as I think that it’s only fair I shouldn’t edit his post. “This is Walther Tröger, an 83 year old man who once was the president of the National Olympic Committee for Germany and member of the International Olympic Committee. During the 1972 olympics he took part in the negotiations with the terrorists who later killed Israeli athlets. Tröger is definitely no Nazi. He is an old man with stiff joints who tries to wave like the athlets do. Thank you Britain for once again putting us Germans into the Nazi corner. Thank you very much. Sorry, Cyrano1202 and other Germans who were offended. What I would say is that it certainly did look like the German President, Joachm Gauck, I never thought whoever it was deliberately meant to give the impression that it was a Nazi salute. I personally thought it was hilarious and the most inappropriate accident since Chancellor Gerhard Schröder visited Yad Vashem and accidently turned off the eternal flame at the holocaust memorial.